Sea of Faith, Cambridge: Next Sea of Faith Meeting in Cambridge — Wednesday 4 February 2015 — Exploring J. L. Schellenberg's idea of "Evolutionary Religion"
Next Sea of Faith Meeting in Cambridge — Wednesday 4 February 2015 — Exploring J. L. Schellenberg's idea of "Evolutionary Religion"
We have just set the date for the first meeting in Cambridge during 2015. It is on Wednesday 4 February. As always it takes place in the church hall of the Memorial Church, Cambridge and will start promptly at 7.30pm and finish at 9.30pm. J. L. Schellenberg articulates and defends a simple but revolutionary idea: we are still at a very early stage in the possible history of intelligent life on our planet, and should frame our religious attitudes accordingly. Humans have begun to adapt to a deep past—one measured in billions of years, not thousands. But we have not really noticed how thin is the sliver of past time in which all of our religious life is contained. And the eons that may yet see intelligent life have hardly started to come into focus. When these things are internalized, our whole picture of religion may change. For then we will for the first time be in a position to ask: Might there be a form of religion appropriate to such an early stage of development as our own? Might such 'evolutionary religion' be rather different from the forms of religion we see all around us today? And might it be better fitted to meet the demands of reason? Though most concerned simply to get a new discussion going, Evolutionary Religion maintains that the answer is in each case 'yes'. When the light of deep time has fully been switched on, a new form of skepticism but, at the same time, new possibilities of religious life will come into view. We will find ourselves drawn to religious attitudes that, while not foregoing the idea of a transcendent ultimate, manage to do without believing and without details. 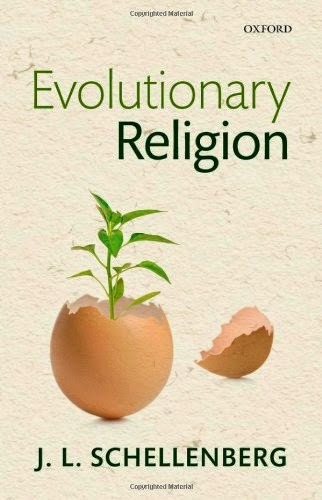 As Schellenberg reveals, pursuing evolutionary religion instead of embracing a scientific naturalism is something that can rationally be done, even if traditional religious belief is placed out of bounds by argument. And ironically it is science that should help us see this. Indeed, in a new cultural dispensation evolutionary religion may come to be a preferred option among those most concerned for our intellectual enrichment and for our survival into the deep future. John Schellenberg's own website contains a series of filmed interviews that people may wish to explore before coming to the meeting. Click here to go there.